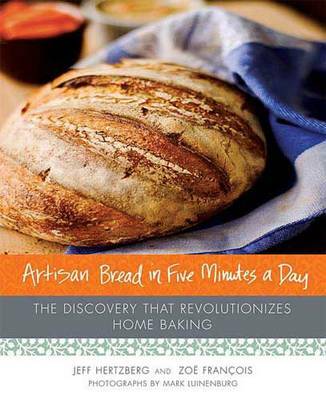 See Recipe Girl's take on (with the recipe) Boule (artisan free-form loaf) from this cookbook. Unbelieveably easy and delicious. This recipe has changed my thinking about baking bread. Finally tried this. Followed their directions pretty much to the T the first time, except had to bake longer. Loaf was dense. Second time I let rest much longer before baking - about 1 1/2 hours and the last 20 minutes was in my warming drawer. The bread came out great! Fast & easy. Great crust. My everyday bread recipe. I cook it in a Le Creuset dutch oven. When I learned that the recent editions of this book listed ingredients by weight, I bought the kindle edition. There are a few additions but the basic recipes have not been changed except for weights, The all-purpose flour weight for this recipe is 2 pounds or 920 grams. Also the yeast is reduced to 1 tablespoon. This method works great with very wet dough, producing big holes and a chewy inside. This is my go-to recipe from this book. I have not yet mastered the shaping, exactly, but this dough even in a batard/baguette shape is a wonderful social-with-cheese-and-salami bread. When made with sourdough, the most delicious of all the Francois & Hertzberg breads. I add 1 + 1/2 cups sourdough, reducing AP flour & water accordingly. Preferring more whole grains, I make the recipes in their Healthy Bread book more often. But for us this is tops for flavor, & fast-disappearing. Probably my most-used recipe. Deeply satisfying baked as a loaf or baguette. Delicious as pizza or flatbread dough, too. This is a decent bread. Last time I made it was when the book first came out about six years ago. I successfully quartered the recipe both times to make just one small loaf. I mixed the dough a day ahead, let it rise and collapse, and refrigerated overnight; shaped, proofed and baked the following afternoon. The small size of the loaf is perfect for the two of us. I used this base recipe to make the pita bread included in this book. It was very good, came together in a flash, and mixing the dough in the morning and using it later that evening worked well. Made this as crust for Spicy Pork Buns (p.88). Super easy dough with good flavor. The recipe makes enough for 16 pork buns, so if you only want 4 pork buns, you can make only 1/4 of the recipe. I made the full batch and put the risen, unused dough in refrigerator and will use for loaves of bread. I used medium grind corn meal, with is okay, but I think it might be better with a finer grind to eliminate grittiness. Next time! Excellent way to use leftover pork roast. The yeast dough with cornmeal made a sturdy, chewy, delicious crust that doesn't get soggy (I ate leftover bun cold for lunch the next day & crust was still great). I made with a combination of ground chilies (2 tsp. ground chipotle, 1 Tbsp. ground ancho, 1 Tbsp. commercial chile powder); the filling was spicy but not overwhelming. Serve with hot sauce, so people can make it hotter if they like. I didn't measure how much pork I had, but it was probably more like 2 cups (rater than 1-1.5 called for in recipe). The sauce to filling ratio was just right, though it made enough filling for 8 large buns (vs. the recipe's 4). The recipe calls for thickening the sauce with cornstarch. This was completely unnecessary. I quadrupled the amount of cilantro, adding about 2 Tbsp. chopped (not minced) cilantro to each roll. Roll out and bake rolls on 8" squares of parchment to make getting in and out of oven easier. I've made this 3 times since September with roasted pureed butternut from the freezer. Each time I've rolled it out, sprinkled with a few tablespoons of cinnamon sugar, spiraled it into a loaf, and baked it into a tall, soft, plush sandwich bread that's fragrant but not sweet and cuts like a dream with a gorgeous swirl in the center. I think I'll make it again tomorrow. A very good bread--not a greasy and dense as the Cook's Illustrated cheese bread~ much more bread-with-cheese-flavor, versus the pockets-of-cheese style. Might benefit from a shot of red pepper flakes? Could also be that I am not a cheese bread person, and that's the gap. Is a very nice example of the genre. I use a kitchen scale to measure flour out...works great. Often I use garlic infused oil in place of evoo. Just made amazing feta and spinach pan pizza. This recipe was the start of a sad/glorious situation: most pizzas we eat out no longer measure up to homemade. I've since moved on to using the basic recipe in ABin5 Pizza cookbook (no olive oil, a slightly different yield), but this recipe/method began it all. The instructions in this book made homemade pizza go from a special project dinner to a quick, easy weeknight go-to. Used to make pizza dough with good results. Very flavorful if using a fruity olive oil. Did not use the right amount of water apparently (very watery dough, had to add flour). Yes, YES to this beautiful and fragrant stromboli-ish creation. Made quicker by roasting multiple red peppers and freezing them in individual baggies (they defrost in minutes under hot water). 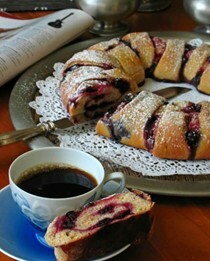 I've made this recipe with many different doughs successfully. Sticky dough is no problem if you bake on a silicon mat or parchment. Roll/press out the dough (who cares if it sticks underneath), cut the slits, spread to create the holes, then fold the mat/paper over the red pepper and then use fingers or a spatula to gradually peel it off. Good taste. I made this with the peasant dough. I stretched it a little too thin thinking it would make it super crispy but the thin parts actually became too hard. The rest of the bread was very good though. I added a little bit of spicy coppa on top and it was fantastic. This pita bread recipe came together very quickly. I used the light whole wheat bread dough from the same book, and the pita were light and pleasantly chewy. Perhaps because I baked them directly on a baking steel on the lowest rack in the oven, I found that the pitas needed only 2.5-3 minutes in the oven, otherwise the bottom would get too hard and start to char. To make a more manageable number of pitas, I halved the dough recipe. It's wonderful to be able to mix the dough together quickly in the morning, and then roll it out for fresh pita with dinner that same evening. These are so quick and easy. The trick is to roll them thin enough and put them on a well heated pizza stone. I love to see them puffed up huge! Nice and fresh. Easy to make in the blender. Very refreshing and very easy soup for the summer. Absolutely delicious and super easy to make. I use fresh organic eggs and local honey from the farmers market. I used little individual brioche molds and the result is outstanding. The trick is to put the right amount of brioche into the mold (which should be about half full) and to form the little ball at the top correctly. I formed a large ball as described in the book, then the small one with the sides of my hands, finally pinching firmly to stabilize the small one. It worked great the first time, not so great with my second attempt because my molds were overflowing with dough after the rising period (I had used too much dough). Tried to use this dough for soft, buttery dinner rolls; looking for a ABin5-style recipe without all the butter and egg of the brioche and challah. Baked up too crusty even when nestled in a cake pan and dipped/brushed with tons more butter. Great flavor and texture, just not what I was looking for at the time. Will make again as a sandwich bread. Each loaf of bread I baked tasted better than the last, with a pleasant tang, a more nuanced wheaty flavor. Soon the bread will be making itself... The crusty, full-flavored loaf that results may be the world’s easiest yeast bread. ..the instructions were explicit, yet simple, and though they’re long… the method really was very quick and effortless. The freshly baked loaf was… crusty exterior and perfectly baked inside. There's nothing like the smell of freshly baked bread to fill a kitchen with warmth, eager appetites, and endless praise for the baker who took on such a time-consuming task. Now, you can fill your kitchen with the irresistible aromas of a French bakery every day with just five minutes of active preparation time, and Artisan Bread in Five Minutes a Day will show you how. Coauthors Jeff Hertzberg and Zoë François prove that bread baking can be easier than a trip to the bakery. Their method is quick and simple, bringing forth scrumptious perfection in each loaf. Delectable creations will emerge straight from your own oven as warm, indulgent masterpieces that you can finally make for yourself. In exchange for a mere five minutes of your time, your breads will rival those of the finest bakers in the world. With nearly 100 recipes to put this ingenious technique to use, Artisan Bread in Five Minutes a Day will open the eyes of any potential baker who has sworn off homemade bread as simply too much work. Crusty baguettes, mouth-watering pizzas, hearty sandwich loaves, and even buttery pastries can easily become part of your own personal menu, and this innovative book will teach you everything you need to know.